I am proud and honored to serve as the 2015 MGTA president. On February 5, we kicked off the year with our annual meeting at a new venue, Pinstripes. This highlights our organizations reinvigoration over the past year. Just one year ago, the MGTA was an organization with just under 450 members, fast forward one year and we have grown to over 600 members. This success could not have been possible without the work of our committee and board volunteers, and the continuing focus on development. As a volunteer organization, this growth rate is phenomenal, and I thank all those who’ve taken part in our success. I look forward to meeting with each of you at our seminars, events and programs this year. We have ambitious goals, which I’m confident will be achieved with your help and participation. As always, we are open to hearing any suggestions for future development; feel free to contact me. MGTA SEMINAR: Importer Security Filing (ISF) Are you Prepared for Full Enforcement? 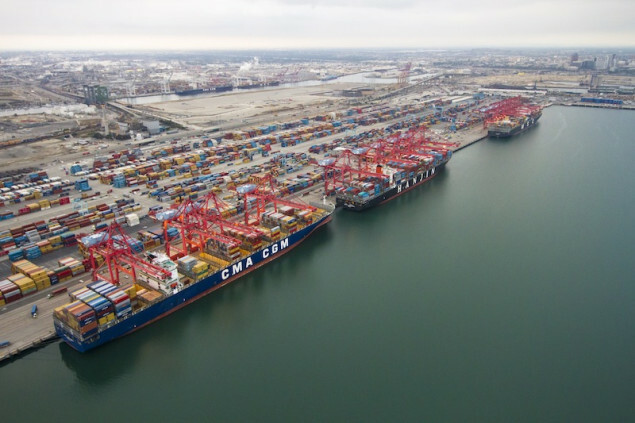 LOS ANGELES, Feb 21 (Reuters) – A group of shipping companies and a powerful dockworkers union reached a tentative labor deal late on Friday after nine months of negotiations, settling a dispute that disrupted the flow of cargo through 29 U.S. West Coast ports and snarled trans-Pacific maritime trade with Asia. The agreement, confirmed in a joint statement by the two sides, was reached three days after U.S. Labor Secretary Thomas Perez arrived in San Francisco to broker a deal with the help of a federal mediator who had joined the talks six weeks earlier. The White House called the deal “a huge relief” for the economy, businesses and workers. President Barack Obama urged “the parties to work together to clear out the backlogs and congestion in the West Coast ports as they finalize their agreement,” the White House said in a statement. The 20,000 dockworkers covered by the tentative five-year labor accord have been without a contract since July. The dispute had reverberated throughout the U.S. economy, extending to agriculture, manufacturing, retail and transportation. Supply chain disruptions have hit from automakers to consumers of french-fried potatoes at McDonald’s Corp restaurants in Japan. Wal-Mart Stores Inc, the world’s largest retailer, said on Thursday the dispute had caused delays of “pockets of merchandise” and that the potential cost had been included in the company’s earnings forecasts this week. The deal was welcomed by groups such as the National Association of Manufacturers and the U.S. Meat Export Federation. U.S. meat exporters have had to put millions of pounds of beef and pork into cold storage, ship by air or use Canadian or Mexican ports, rather than send it out through West Coast ports. Tyson Foods Inc and Cargill Inc are among the leading U.S. pork and beef producers. Tensions arising from the talks have played out since last fall in chronic cargo backups that have increasingly slowed freight traffic at the ports. According to the American Association of Port Authorities, some $3.8 billion worth of goods move in and out of U.S. seaports each day. The West Coast ports handle nearly half of all U.S. maritime trade and more than 70 percent of the country’s Asian imports. Shipping companies have sharply curtailed operations at the marine terminals, suspending loading and unloading of cargo vessels for night shifts, holidays and weekends at the five busiest ports. Perez said that as part of Friday’s accord, the International Longshore and Warehouse Union and the shippers’ bargaining agent, the Pacific Maritime Association, agreed to fully restore all port operations starting Saturday evening. The deal is subject to ratification by the union rank-and-file and the individual shipping lines and terminal operators that make up the PMA. No details of the terms were immediately revealed. Perez was sent to California on Tuesday as an emissary for Obama, who had come under mounting political pressure to intervene in a labor conflict that by some estimates could have ended up costing the U.S. economy billions of dollars. The principal sticking point when he first joined the talks, Perez told reporters after the agreement, was the arbitration system for resolving workplace disputes under the contract. He did not disclose how that impasse was overcome but said the parties agreed to changes that would improve the system while “ensuring fairness to both sides. Perez, who had been joined at times during the week by U.S. Commerce Secretary Penny Pritzker and Los Angeles Mayor Eric Garcetti, exited the talks Friday morning after one last meeting with both sides. Announcement of an agreement came hours later. Disruptions at the ports have been blamed by each side on the other as pressure tactics. Cargo loads have faced lag times of two weeks or more as dozens of inbound freighters stacked up at anchor along the coast, waiting for berths to open. California farmers were especially hard hit, with port disruptions threatening perishable goods headed to overseas markets and export losses estimated to be running at hundreds of millions of dollars a week. Japan’s Honda Motor Co said earlier this week it would slow production at some of its North American plants due to delays in parts shipments from Asia while Toyota Motor Corp said it had reduced overtime at some factories. Nissan Motor Co Ltd said it had been somewhat affected. Honda and other car manufacturers said they were switching to higher-cost air freight to minimize delivery slowdowns. Singapore-listed Neptune Orient Lines’ container shipping unit partly blamed the congestion for an 8 percent decline in its fourth quarter. Port officials have said it would take six to eight weeks to clear the immediate backlog of cargo containers piled up on the docks and several months for freight traffic to return to a normal rhythm once the dispute was settled. Besides work slowdowns the companies accused the union of staging to gain bargaining leverage and the curtailed operations the union said were designed to squeeze its members, the West Coast waterfront still faces a range of systemic problems cited by port authorities as factors in the backups. Still, the settlement averted a worst-case scenario of the labor dispute devolving into a full-scale, extended shutdown of the ports, which the retail and manufacturing industries have projected could cost the U.S. economy some $2 billion a day. As new pipeline construction approval has stalled, oil-by-rail has become a popular method of moving product from the Bakken and Alberta Oil Sands developments. However, the threat of derailment in populated areas remains a true concern – as was proven in Lac Megantic, QC in 2013. On Monday (2/16), a CSX train hauling Bakken crude oil derailed in West Virginia with at least 14 cars catching fire and two nearby towns evacuated. At least one of the tank cars has entered the Kanawha River, and one car ran into a house before bursting into flames. One person was being treated for potential inhalation issues, but no other injuries were reported. The 100-car train, which was hauling tank cars of crude oil from Alberta, was eastbound late Saturday (2/14) when several tank cars back from the locomotives jumped the tracks, according to what witnesses told Transportation Safety Board (TSB) investigators. There were no injuries. It is believed the fire spread to a total of seven tank cars. In all 29 tank cars went off the rails. In response to incidents like these, a new U.S. standard for trains carrying crude would first require companies to upgrade tank cars known as DOT-111s, which safety investigators have said are prone to puncture in rail accidents. The draft rule also would require that new cars be built with steel shells that are 9/16th of an inch thick, people familiar with the plan said. The walls of the current cars, both DOT-111s and the newer CPC-1232 models, are 7/16th of an inch thick. The American Trucking Associations’ seasonally adjusted Truck Tonnage Index was 5.2% higher Y/Y in December, compared to a 4.4% Y/Y gain in November. Full year 2014 tonnage was up 3.5% Y/Y, while 2013 tonnage was up 6.3% Y/Y. The tonnage index was flat M/M in December following a 3.5% increase M/M in November. Dry-Van rates in the spot market through early February were $1.91 per mile, as better weather has eased demand and lower diesel prices has reduced fuel surcharges. On a 4 week rolling average, spot rates are 4.5% lower Y/Y. Our work indicates expectations for continued tight capacity have driven earlier contract pricing discussions, with shippers seeing 5-7% rate increases excluding fuel in 2015 versus 3-5% Y/Y in 2014. Through early February, flatbed rates in the spot market were $2.05 per mile on a trailing 4 week basis, down 1.3% Y/Y. Lower fuel surcharges has contributed to the recent decline in spot rates. Most flatbed carriers are focused on contract rate increases excluding fuel in the mid to upper single digits for 2015, after a year of mid to high single digit rate increases in 2014. During December, inbound containerized ocean volumes at all U.S. ports increased 7.9% year-over-year, ahead of weaker Y/Y growth during November. 2014 volumes were up 6.0% as compared to 2013. This higher growth in landed containers during December appears to be largely driven by congestion at the West Coast ports, which pushed volumes from November into December. Eastbound trans-Pacific ocean container spot rates between Hong Kong and the U.S. West Coast fluctuated in January, before falling at the end of the month, with rates now 1.6% lower than at this time in 2014. 2014 rates averaged 4.2% lower than 2013 rates, driven by weaker 1H14 pricing. As of January 1st, shipyards around the world hold orders for 454 new containerships with an aggregate capacity of 3.388 million TEUs which represents approximately 18.4% of the existing world fleet. Despite the fact that capacity growth has outpaced demand, container capacity is projected to rise 7.8% in 2015, 5.3% in 2016, and fall 0.4% in 2017. Through the end of January, CSX reported 1Q15 volumes up 8.1% Y/Y, while NSC reported carloads up 8.3% Y/Y, due to strong stone, petroleum, and intermodal volumes. Interestingly, CSX coal volumes have been up Y/Y due to replenishment of utility stockpiles. • Through the end of January, UNP reported 4Q14 volumes up 1.1% y/y, while BNSF reported 1Q15 volumes up 0.1% y/y. Greece, officially known as the Hellenic Republic, is located in the northeastern corner of the Mediterranean Sea and forms the southern tip of the Balkan Peninsula in south-east Europe. As a member of the European Union (EU), US-Greek trade relations are governed by the legal framework between the United States (US) and EU as a whole and within the context of the multilateral agreements of the World Trade Organization (WTO). In the past, US exports to Greece have largely consisted of telecommunications equipment, electrical equipment, computers and electronic equipment, medical and pharmaceutical products, machinery and parts, and timber and wood pulp as well as other agricultural products. The primary Greek products exported to the US include food and agricultural products, tobacco, razors, petroleum products/ by-products, cement, clothing and apparel, marble, steel products, and pipes. In 2014 US exports to Greece totaled approximately US$ 713.1 M, with imports from Greece totaling about US$ 966.9 M. Greece’s main import partners are Russia, Germany, and Italy, and primary export partners are Turkey, Italy, and Germany. A Parliamentary Republic, Greece has a President who acts as head of state and is elected by Parliament every five years, with a Prime Minister serving as the head of the government. The Prime Minister serves on the Ministerial Council, which is the collective decision-making body that forms the government of Greece and also includes Ministers, Deputy Ministers, and Ministers without portfolio. General elections are normally held every four years unless the Parliament is dissolved earlier, with each new government that is formed after a general election or the previous government’s resignation required to appear before Parliament and request a vote of confidence. Due at least in part to unrestrained spending, cheap lending, and the failure to implement financial reforms Greece became Europe’s most indebted country. The global economic and financial crisis beginning in 2007-2008 revealed Greek debt levels and deficits that exceeded limits set by the Eurozone, and since May 2010 Greece has been receiving financial support from Euro area member states and the International Monetary Fund (IMF). This Economic Adjustment Program is intended to support the Greek government’s efforts to restore fiscal sustainability and implement structural reforms to improve the competitiveness of the Greek economy and provide the foundation for future sustainable economic growth. The release of each disbursement to Greece is only approved after a review is conducted by the European Commission, European Central Bank, and IMF (the so-called “troika”) in order to gauge Greece’s compliance with the terms and conditions of the Program. Greek elections in January 2015 resulted in a new government whose main agenda is the rejection of the budgetary cuts and restructuring demanded by the troika in return for its financial support. Although the new Prime Minister Alexis Tsipras has stated that he wants to end austerity measures without causing a “catastrophic break” with Europe, it remains to be seen what if any agreement can be reached with lenders and whether Greece will remain in the Eurozone. Who would have known that 6 days after the traditional “Happy New Year” greetings, the whole world would once again be shaken by another terror attack? On January 7, 2015, two men, Saïd and Chérif Kouachi, killed 12 people at the satire newspaper Charlie Hebdo office in Paris, France. According to the BBC, this was the deadliest terror attack in France since 1961 during the Algerian war. Among the victims were Stéphane Charbonnier, editor of the Charlie Hedbo magazine, and four of his most popluar cartoonists: Tignous, Cabut, Wolinski & Philippe Honoré. Their crime? Drawing cartoons of the Prophet Muhammad the same way that they had drawn caricatures of famous world political (current French President Francois Hollande comes to mind) and religious leaders (such as Pope Francis). On January 10th of this year, the German newspaper Hamburger Morgenpost was firebombed after the newspaper reprinted several of Charlie Hebdo’s Muhammad cartoons. On February 14th, an unidentified gunman stormed a Copenhagen café where Swedish cartoonist Lars Vilks was attending a free speech forum. Vilks was known for his controversial depictures of the Prophet Muhammad and has been targeted for death by Islamic extremists because of his work. The cartoonist was not hurt but the shooter did kill a 55 year-old man and wounded three officers before fleeing. One may or may not agree with the work produced by satirical cartoonists and some of us may be offended by it. The violence of those events is another reminder that the freedoms that we sometimes take for granted are fragile and that they are far from being appreciated by everyone. It is our responsibility and our duty to make sure that we continue to fight to preserve them.